From left, Dmitri Ben, Chris Scott, First Student Location Manager; Michelle Jerome, Hunter Martin, Damon Wilkinson, Caleb Wilkinson, Ken Nicholas, Owen Jerome, Tanner Martin, Henrik Ben and Valeria Muniz. Photo submitted by First Student dispatcher April Smith. 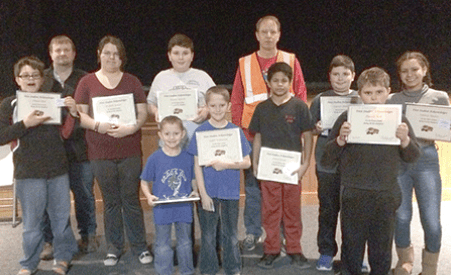 LISBON – Several Lisbon students were honored for their “outstanding cooperation” during a Dec. 22 school bus fire. The students were given awards from First Student Inc., the company that owned the bus, for their outstanding cooperationThe bus was destroyed in the fire. in a bus emergency. No injuries occurred during the incident, thanks to quick action from the bus driver, according to a statement from the company. The bus was completely destroyed following a fire that stemmed from what the company says was an electrical issue.